*Ssssssnifffff* Smell that? 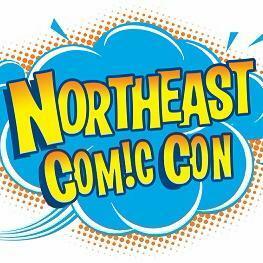 That reek of sweat, urine, fetid organic material, steel, blood and adrenaline? That’s the smell of Blame! 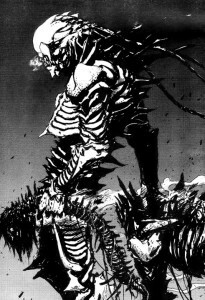 by Tsutomu Nihei, the H. R. Giger of Japanese industrial cyber-punk. Finally, an intense sci-fi horror manga. Blame! vol 1-3 is a fast read despite the slowest burn of slow-burn stories, but my god does it have something going for it. Killy, our “protagonist” is a man of few words and industrial-survivalist fashion who is looking for the rarest of humans – net gene carriers – the only humans who are able to bridge the gap between the physical and the digital without dying. In his journey he encounters cyborgs, humanoids of every height and breeding, silicon beings, and humans of every evolutionary level. Machine and man live by every method of madness in the world of Blame!, and they all either want something of Killy. From robbing to allying to killing him, Killy must persevere in his journey despite the impossible odds stacked against him. As Keith Johnson states in his essay, “Nihei Tsutomu and the Poetics of Space: Notes Toward a Cyberpunk Ecology”, “Architecture is (quite literally) a concretization of thought. What then, are we to make of Nihei’s architecture… [but the] mounting sense of architecture as profoundly inhuman”.1 This inhuman atmosphere of Blame! is central to the series’ appeal. Each page is populated with industrial scenery and angles so complex that it puts Akira and Metropolis to shame. This passion for architecture is in every panel of Nihei’s manga. The endless cityscapes, jointed and segmented “silicon lifeforms”, and bulky weaponry befits a Bladerunner spin-off, or a more serious Fifth Element sequel. Buried under thousands of stories of concrete, steel and wires the reader gets a sense of Killy’s confinement in his world. It is both claustrophobic and sprawling like a concrete version of the 2005 movie The Descent. The world of Blame! works off of the inevitability of transhumanism, thus creating a meandering story that is both bleak, frightening and fascinating. Humanity will become the prey/power source of human-roboticism, which in turn will become the building blocks of silicon creatures, who in turn will becomes purely digital entities. The Net, as the internet is referred to in Blame!, is a higher realm that has built itself into a self-contained biosphere with its own ecosystem and life. Humanity has been outpaced by the evolutionary force of self-perpetuating machines, and now barely clings onto existence. It’s a bleak world that Blame! presents, but one in which humanity is too stubborn and angry to abandon. 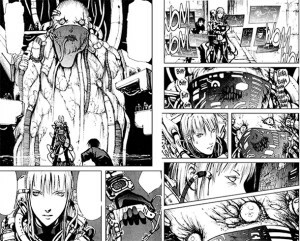 Nihei clearly values the world he is creating over story structure since, in terms of plot, there isn’t much there. Drama is generated in Blame! when characters and creatures bump into each other. The dialogue is very sparse, and what words do occupy page space serve only to communicate only the most necessary information i.e. names, level numbers, directions to human colonies, etc. The episodic chapters of Blame! 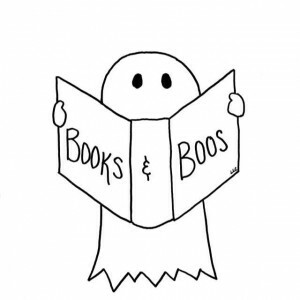 vol 1-3 could be read in any order without consequence. Really the only reason to read the books in chronological order is to keep track of Killy’s traveling companions and to create a linear time line as he travels farther and farther up the vertically stacked world-wide city. If you’re looking for the context of why Earth is now covered in an ever expanding, semi-sentient city or how the rift appeared between organic life and artificial then you had better be ready to invest in the whole series as well as the spin-offs. What little backstory is given is scattered in little pieces throughout Nihei’s works. Blame! is the ground floor of Nihei’s cyberpunk skyscraper. From the intense and grimy world building of Blame! come a number of successive titles starting with Noise, the origin of the silicon creatures, then Biomega, which explores the zombie-esque transformation of humans into primitive silicon creatures. But wait, want to hear a real mind f**k? Nihei created a wolverine comic that takes place in a possible future Marvel universe that collides with Blame!. 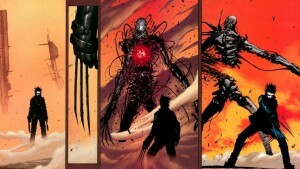 Yeah, in an AU timeline Wolverine battles cyborgs alongside the last bastion of humanity! At present the now semi-defunct publisher Toykopop holds the rights to Blame!. 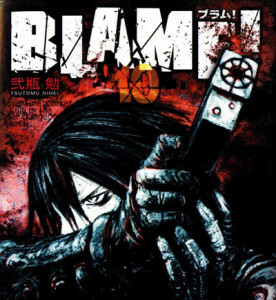 As such the quality of the English printed version of Blame!, as well the availability of all 11 volumes, is suspect. 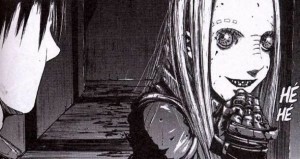 Thankfully there is some hope, as omnibus versions of Blame! 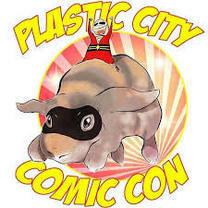 are available via Vertical Comics. 1 Johnson, Keith Leslie. “Southeast Review of Asian Studies”. Volume 35 (2013): 190-203.